I loved Andy Weir’s first book, “The Martian”, it was more humorous than I expected, and “Artemis” is like that. The main character, “Jazz” (Jasmine Bashara), has lived on the moon in Artemis since she immigrated there with her father from Saudi Arabia when she was six years old. She grew up there, and although she could have been a master welder, and has “so much potential” according to her father, a devout Muslim, she has become a bit of an outlaw. Her official title is Porter, however, she is actually a smuggler, and she uses her job as a porter to deliver smuggled goods that are banned on Artemis. Flammable goods, light drugs, cigars, etc., but she does have standards, no heavy drugs, and no guns! The one law enforcement officer on Artemis, Rudy, has been trying to catch her red-handed for years, and his main goal in life seems to be catching her so he can deport her to Earth/Saudi Arabia. Of course, Jazz wants no part of Earth or gravity sickness, nor any of the things it would take to get her to acclimate to Earth again. She just wants to be rich. She currently lives in what is not so fondly called a coffin, as it is only big enough to sleep in, not to stand up in, she doesn’t have a private bathroom or shower, and she wants to make enough money to get a place she can walk in and have a private bathroom. (without working for her father). In her goal to become rich, she takes a job above her smuggler status and gets in over her head. She can lose her citizenship on Artemis, she’s being chased by Rudy, her father is now in jeopardy, there has been a double murder, and unbelievably, the entire citizenship of Artemis is in danger, and a mob hitman from Brazil is on the moon, in Artemis, and chasing her. Andy Weir does not disappoint with this novel. It is just as good as The Martian, and it would make a fun movie to watch. Sunday Story – I want to become a runner – but I’m frightened! See how this could scare the neighbors? It’s just not right to do that, I want to be a good neighbor. So, that leaves me with early morning or late night runs. I use the term “runs” loosely – there would probably be too many walking breaks (also called I-think-I’m-dying-and-need-to-throw-up breaks) to call it actual running. Please also note – I am NOT a morning person. So my current dilemma is that I don’t want to run, but I also don’t want to look like I do. Seriously, a beached whale looks better on the beach than I do! I have to try, and I’m really hoping that I will develop a love of running. I know it might take a while, but getting off the couch and out the front door is probably the hardest part. Well, I read that, but I think the hardest part will be the actual running. And then doing it again the next day. I’m looking for motivation, and I found a run I’d really like to do, it’s called the Color Run, and it looks like a blast! I have a friend who is putting together a team for the Memphis run later this year and I plan to go! Which means I have to train… *sigh* It all comes down to me getting my running shoes on and starting. For the color run you just need to wear a white t-shirt, and at each kilometer you get dusted with a different color. By the end you are full of color and more confidence! I’m going to have to see if this jacket comes in white…. 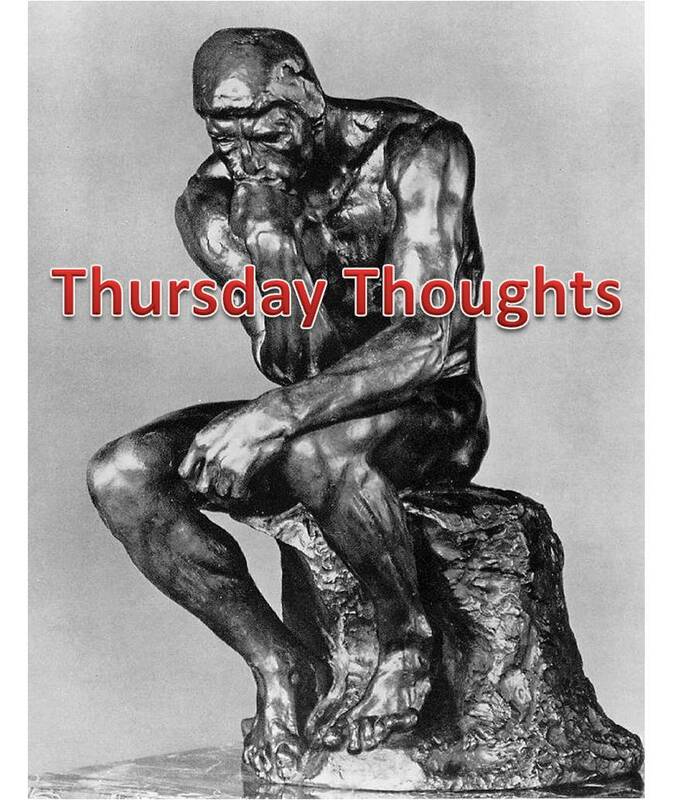 Do you have an inspirational/motivational stories that would help me? I promise to share mine along the way. This week’s teaser is from To the Nines by Janet Evanovich. I’m really enjoying this series, it’s so funny, and I look forward to each one! It’s definitely the brain candy type of book where you can just relax and enjoy it without having to work too hard to keep up with the story line. This excerpt is between Lula and Stephanie – Lula has found a new diet which is supposed to make her a supermodel. “Doughnuts are going to be a problem. Don’t think there’s anything I can eat on a doughnut. So, whats in the cooler? Meat. I got ribs and rotisserie chicken and a pound of crispy bacon. I can eat meat until I grow a tail and moo. This is the best diet. I can eat things on this diet that I haven’t been able to eat in years. I’ve been on a Stephanie Plum kick, so this teaser is from High Five by Janet Evanovich. “You’re not looking for a partner, you’re looking for an enforcer. You hate to run. You must be worried about getting into that little black dress. What did you eat just now? Piece of cake? Candy bar? This week my daughter and her bestie are out of school – they are in a non-traditional school, so they have breaks through-out the year, and a shorter summer. No one else on our street is out of school, so they are a little bored. We decided to have a movie day today since we are probably going to break a heat record here today, and they don’t need another sunburn. We started with Hop, and moved on to We Bought a Zoo (loved), and are about to start on the Mighty Macs (they are both basketball players). We took a trip to the local Dollar store and everyone got two movie candies – including me. Then they talked me into another one for them to share. An hour after breakfast they are settled on the couch with 2.5 movie candies each, and a big bowl of popcorn. After the second movie I made them stop and have a protein filled lunch to combat the sugar high. They are both crashing as we speak. This gives me a bit of down time, so I thought I’d write a post real quick, and get some reading done. I’ve been trying to read Fifty Shades of Grey for almost a week now. I’m struggling to get into it. 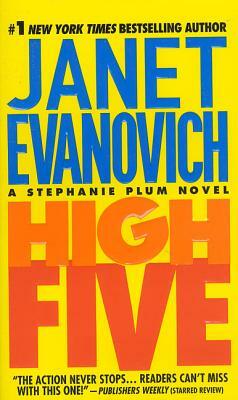 On the other hand I’ve read five Stephanie Plum books by Janet Evanovich in that time frame. I’ve decided that I must be the odd man (woman) out, because to be honest, I’d rather have Joe Morelli than Christian Grey. At least so far. I don’t usually have a hard time getting into books, but I’m struggling to finish Fifty Shades – it’s kind of like a relationship – if you have to force it, it’s probably not worth it. I’m sure Mr. Grey has a different opinion. 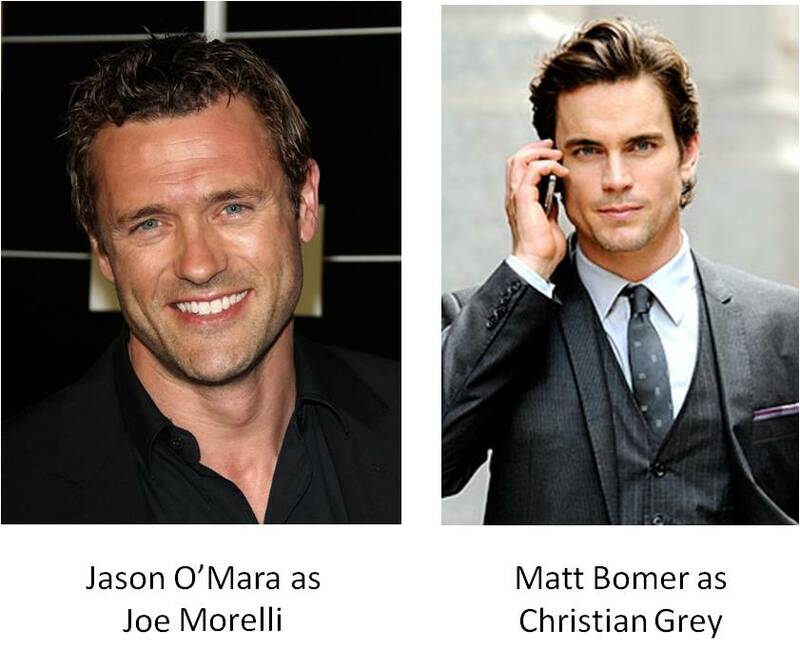 Jason O’Mara has been cast to play Joe Morelli in the movie adaptation of One for the Money, and Matt Bomer is just how I picture Christian Grey. Although the movie rights for Fifty Shades of Grey have been purchased, no one has been cast as Christian Grey as of yet. Speaking of Stephanie Plum, I love the cast for this movie. It probably wouldn’t matter so much to someone who hasn’t read the book/series, but to me these people are so close to what I imagined them to be in my mind while reading the books that I can hardly wait to go see it. 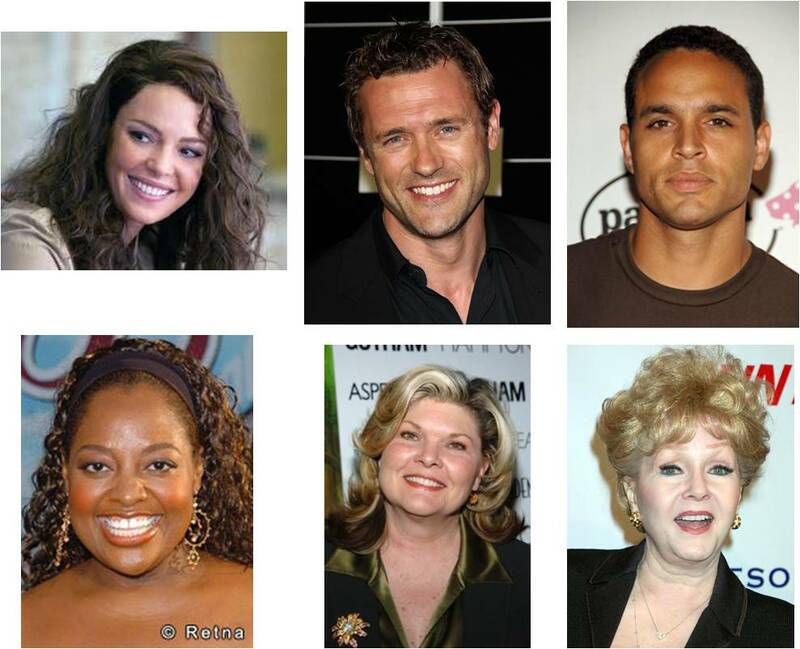 Stephanie is being played by Katherine Heigl, Jason O’Mara as Morelli, Daniel Sunjata as Ranger, Sherri Shepard as Lula, Debra Monk as Mrs. Plum, and Debbie Reynolds as Grandma Mazur. These books are so funny that more often that not I wake the hubby while I’m reading them in bed at night because my laughter shakes him awake. Here’s an excerpt from the beginning of book five, High Five. “My mother was at the door when I pulled to the curb. My grandmother Mazur stood elbow to elbow with my mother. They were short slim women with facial features that suggested Mongol ancestors…probably in the form of crazed marauders. My mother pressed her lips together and made the sign of the cross. ‘You didn’t tell me about this,’ she said to my grandmother. *&##^%*!’, my father said, rattling his paper in the living room. More hilarity ensues later in this book when Grandma Mazur tries out Stephanie’s stun gun at dinner, and knocks Mr. Plum out. For those of you not familiar with Stephanie Plum and her family, she was laid off from her position as a lingerie buyer at a local department store, and blackmails her cousin Vinnie into giving her a job. Vinnie is a bail bondsman, and Stephanie is now a bounty hunter, for which she is sorely unprepared. Murphy’s law was written for Stephanie – if something can go wrong, more than likely it will go wrong for Stephanie. Her first assignment is to track down a local detective who turns out to be Joe Morelli whom she has known since childhood. She has a love-hate relationship with Morelli – he was her first, and afterwards she ran over him with her dad’s Buick because he was a player, not a relationship guy. In her quest to capture Morelli and collect her fee, she absconds with his Jeep, which then gets blown up. In later adventures she blows up half of the local funeral home, gets shot at, and makes friends with a “ho” named Lulu. After a really bad guy leaves Lulu cut and beaten on Stephanie’s fire escape, Lulu changes careers and becomes the file clerk for Vinni’s office, and a companion for Stephanie on her bounty hunts. As you can see from the excerpt above, Stephanie’s family is a hoot, and whenever Stephanie spends too much time with them she gets an eye twitch. (Which many of us can empathize with.) Stephanie says things like, “I’m not one of those people who find their stride. My body was not designed to run. My body was designed to sit in an expensive car and drive.” She rationalizes pizza and donuts, wears too much makeup and big hair, paired with spandex shorts and a sports jersey. She always gets herself into scrapes and her cars get blown up, towed, wrecked or die. If you want a good laugh and an entertaining read, start with One for the Money and go from there. These books, along with the Miss Julia series by Ann B. Ross, are some of the funniest books I’ve ever read! busybusybusylife: My Husband’s Bike Almost Killed Me. This blog, upallnightreading, is mainly about books, reading and other bookish things. My other blog – the one I use to vent about normal life, is busybusybusylife – the link above details my exercise this morning. Feel free to laugh with me!